In Northeast Italy in the administrative region of Emilia-Romagna the hilly and mountainous areas of the Bologna province and Ravenna province where choosen as case study regions. Within those regions two case study areas where choosen. The hilly and mountain area of the Bologna province. The size of the entire province is 3,703 km² of which 36% (1330 km2) is hilly and 21% (790 km2) is mountain areas. 1 009 828 inhabitants live in the province, with an average density of 272,71 inhabitants/km². Where three of the most important public goods identified by the local/regional stakeholders: 1) soil erosion, 2) rural vitality, and 3) carbon sequestration were investigated. And the hilly and mountain area of the Ravenna province. The entire province is 1859 km² and 391,290 inhabitants live there. The area is characterized by intensive agricultural production that focuses on fruit production. Especially in hilly area, water availability is limited due to the high-water intensity of the agricultural production (e.g. actinidia), low rainfall, and scarce freshwater. To overcome this issue, in the last thirty years a number of collective reservoirs have been built. These reservoirs are aimed at collecting rainwater to be used in summer. They are collectively owned and managed by group of farmers. 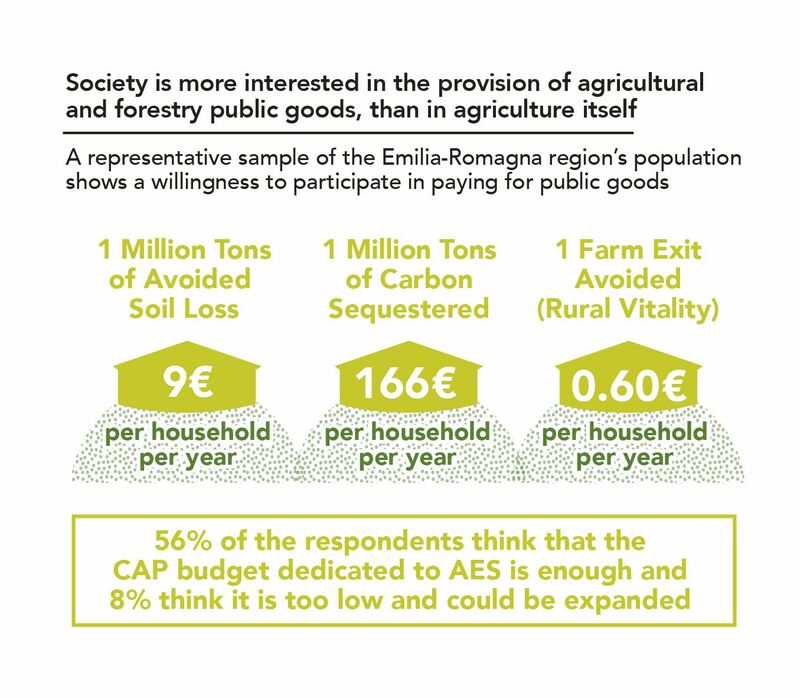 We choose to investigate three of the most important public goods identified by the local/regional stakeholders: 1) soil erosion, 2) rural vitality, and 3) carbon sequestration in Bologna province. The case study area in the Ravenna province is characterized by intensive agricultural production that focuses on fruit production. Especially in hilly area, water availability is limited due to the high-water intensity of the agricultural production (e.g. actinidia), low rainfall, and scarce freshwater. 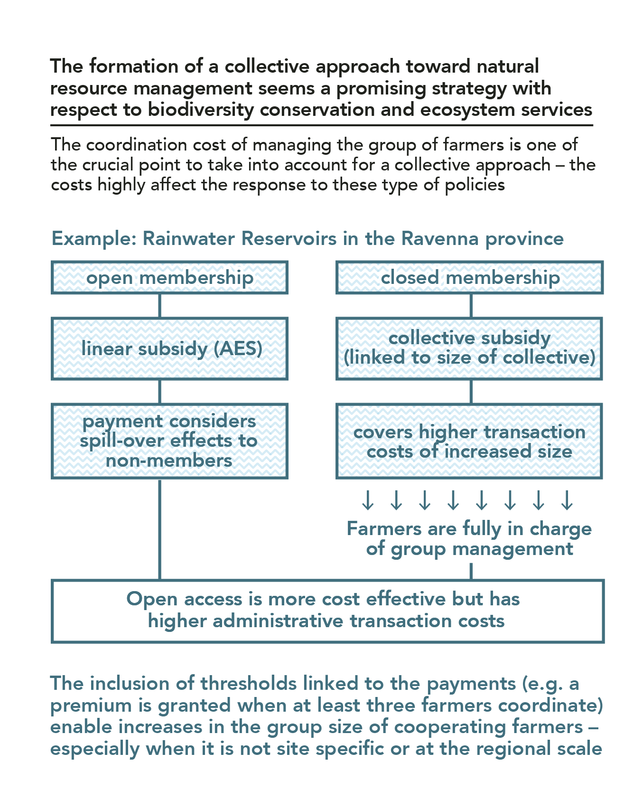 To overcome this issue, in the last thirty years a number of collective reservoirs have been built. These reservoirs are aimed at collecting rainwater to be used in summer. They are collectively owned and managed by group of farmers. Here you find outcomes from the participatory workshops and material in national language.